As reported, at the Super Bowl 2009 you will be able to see two 3D commercials. DreamWorks’ Monsters vs. Aliens and PepsiCo’s SoBe Lifewater will be featured in 3D on Super Bowl Sunday. The 3D glasses you need to see the 3D action are distributed for free at SoBe displays in super markets. The list of shops where you will be able to find the Super Bowl 3D glasses include: Safeway/Vons, K-Mart, Ralphs, Kroger, A&P, Frys, Supervalu, Food Lion, Pathmark, Coburn, Fairway, Fresh Brands, Hy Vee, Nash Finch, Dollar General and Winnie Dixie. Target and Meijers will have the 3D glasses only on January 31st. 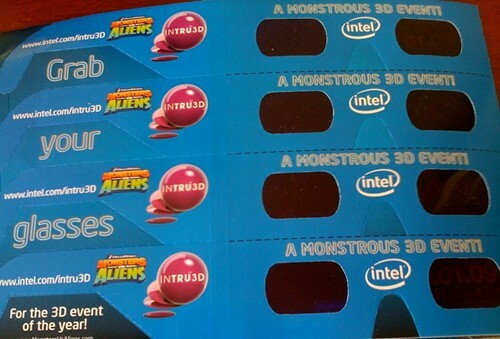 125 million pairs of 3D glasses will be distributed at 25,000 locations. If you still cannot get a pair you are supposed to be able to call 1-800-646-2904 in order to obtain a pair. Subscribe to comments with RSS or TrackBack to 'Where to Get 3D Glasses for Super Bowl Commercials'. I’ve been to your site a few times and I can’t help but notice how helpful it is. I’ve been searching Yahoo for tips and how-to articles. Yours is one of the best that I’ve found and I will definitely be coming back.